Last time I was at my local library, I got a book off the shelf purely because it was called Public Library and the thought of borrowing a book named so amused me. (I am easily amused, and am firmly of the belief that when life throws a serendipitous idea-pun at you, you’d be churlish not to grab it with both hands). 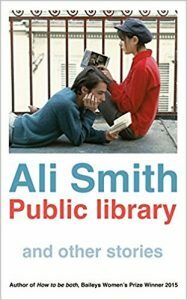 Public Library turned out to be not just a set a sparklingly brilliant short stories by the highly acclaimed Scottish writer, Ali Smith, but also a passionate and spirited advocacy for the institution itself. Smith, along with her editor, decided to ask various people — fellow writers, random strangers, close friends — what they thought about public libraries: “their history, their importance and the recent spate of closures.” She then interleaved the results with her stories — or perhaps it’s the other way round — so the whole book is like a layer-cake, alternating between Smith’s voice and others’. What libraries give you, that no search-engine ever can, is the joy of the browse. In a library, you can judge a book by its cover, pick it up and take it home on a whim, or because its title made you chuckle. It’s an open invitation to meet thousands of authors, to step into exactly the number of parallel universes as there are books on the shelves, for that’s what they are: doorways. Smith’s stories are not set in libraries nor do they feature librarians as characters. They are, however, about books and words and writers, and how life is shot through with connections. In almost every story, a writer lingers around like a ghost. In ‘The ex-wife’, Katherine Mansfield is the third party who gets between the two partners in a relationship; in ‘The human claim’, it is DH Lawrence (or at least his ashes); in ‘The poet’, it is the little-known Scottish poet Olive Fraser. The relationships we forge with the writers whose works we love has a direct effect on our real relationships with the people we love. Smith’s particular genius lies in the way she marries the fantastical and the domestic. Her stories are quirky and often very funny, they are also laser-sharp, tender, deeply odd, and memorable. One reviewer describes them as a ‘nosegay’ handed over but whose flowers have burrs — they stick. Another of Smith’s correspondent describes libraries as, “at heart, helpful and kind providers…. It is the poorest, most isolated and the least able in our society who suffer most if they are gone. If our society does not care for libraries, then it is not caring for its most vulnerable.” Underfunded, underused and under threat — the state of our libraries speaks volumes.